Hello! I hope you all had a wonderful Christmas! I enjoyed some much needed time away from the computer screen to be with my family these past couple of weeks! 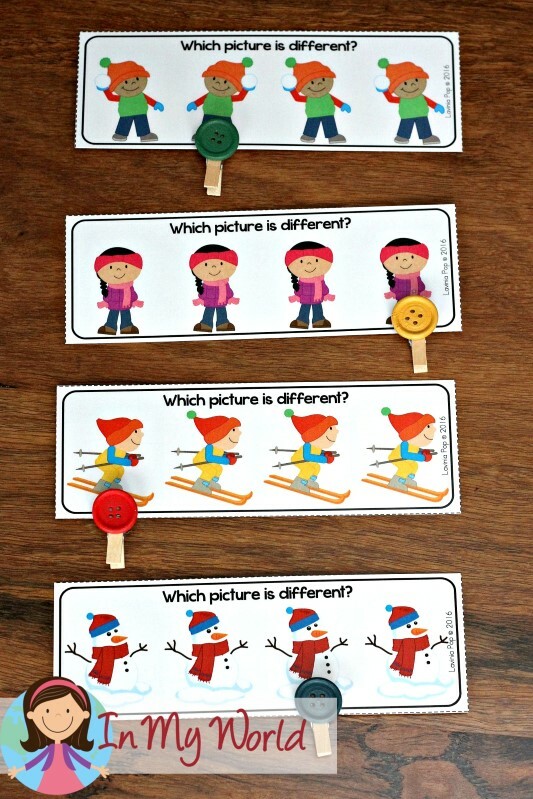 PLEASE NOTE: This blog post contains sample pages from my Winter Preschool Centers packet. You can download the free sample pages by click on the photos in the post. To purchase the complete Winter Preschool Centers packet, please click here! The first activity is an upper and lower case letter tracing activity. I laminated the cards, cut them apart and then made a hole in the top corner of each card. I secured them together with a key ring. Provide kiddos with an erasable marker or crayon and they’re ready to go! As with all my preschool packets, I included an alphabet matching activity. 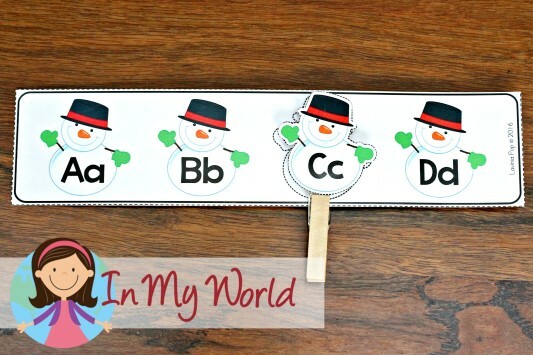 You could use just the mittens for upper and lower case matching or, if your kiddos are ready for the challenge, add in the the beginning sound hat. 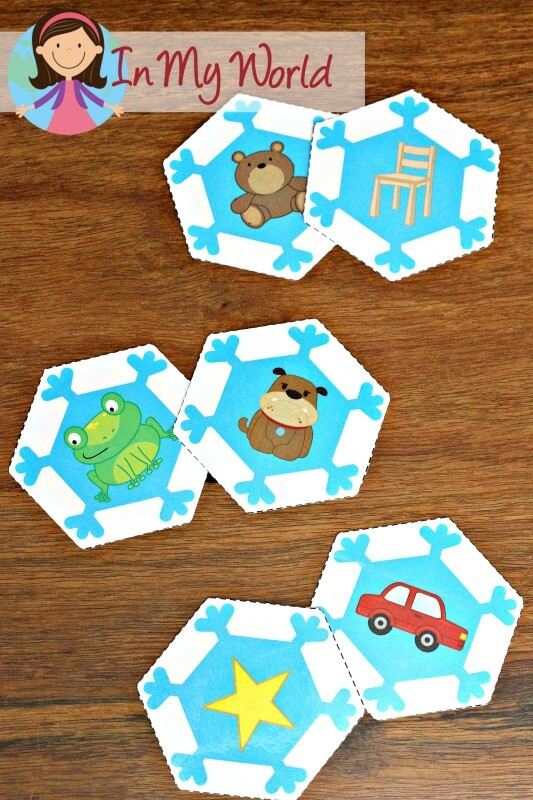 If your kiddos have already mastered matching upper and lower case letters and are working on letter sequence, this next missing letter activity is just the thing for them! The aim of this activity is for children to identify the missing letter and to clip the correct letter in the missing spot to complete the alphabet sequence. Next up, are some syllable cards. 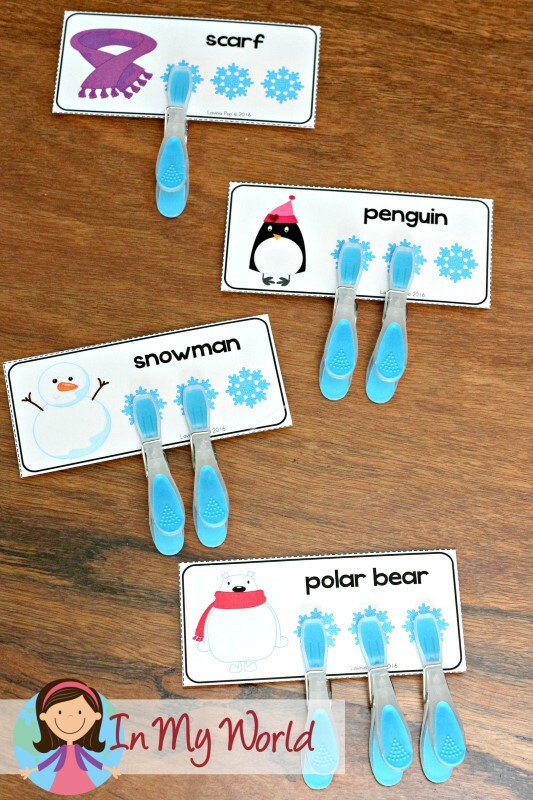 Children can either clap their hands as they say each word or tap each snowflake, and then clip on the appropriate clothes peg to show their answer. I have also included a very basic CVC word reading activity for your kiddos who are ready to begin blending sounds to read words. 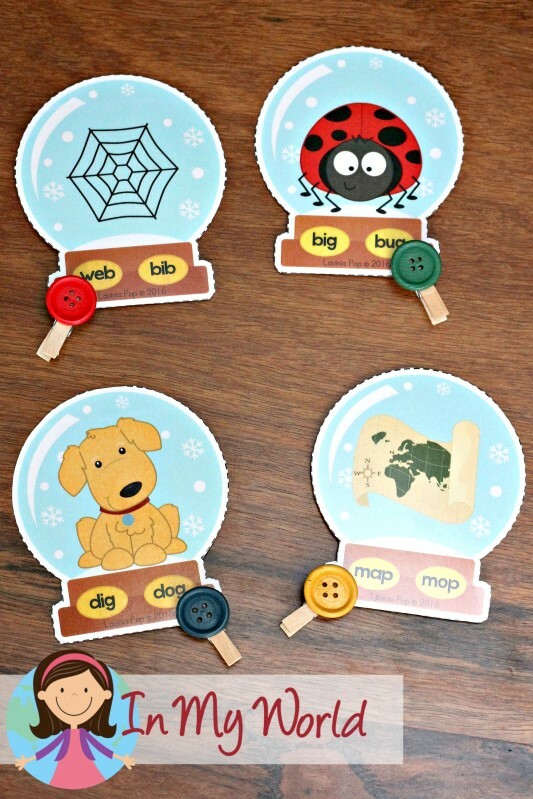 Kiddos read the two words on each snow globe and clip a peg on the word that matches the picture. The aim of this activity is for children to match the two pictures that rhyme. 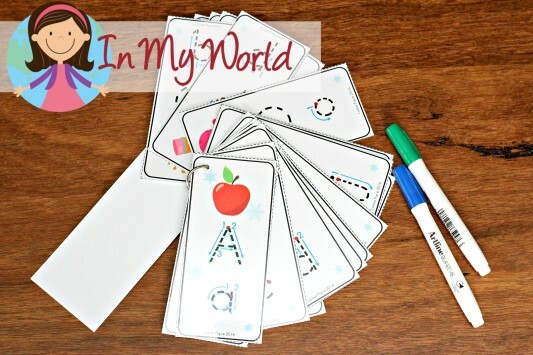 To finish the literacy section of this packet, I have included a pre-primer sight words activity intended for use in a pocket chart center. 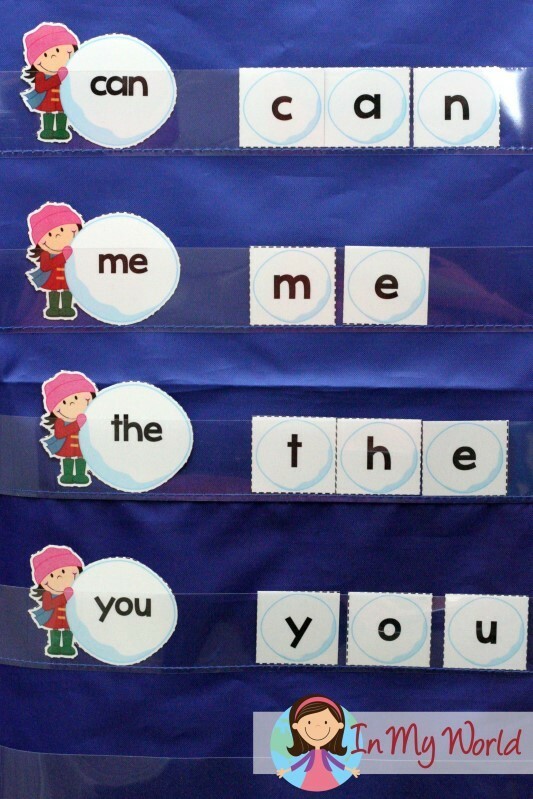 Children simply build the sight words on each card using the snowball letters. I LOVE color matching activities because, well, they are so colorful! Of course, I had to include such an activity in this packet! While you could use beads, gems, buttons, sequins or any other small colorful objects, I decided to glue some pom-poms onto the ends of clothes pegs, thus incorporating a fine motor aspect. 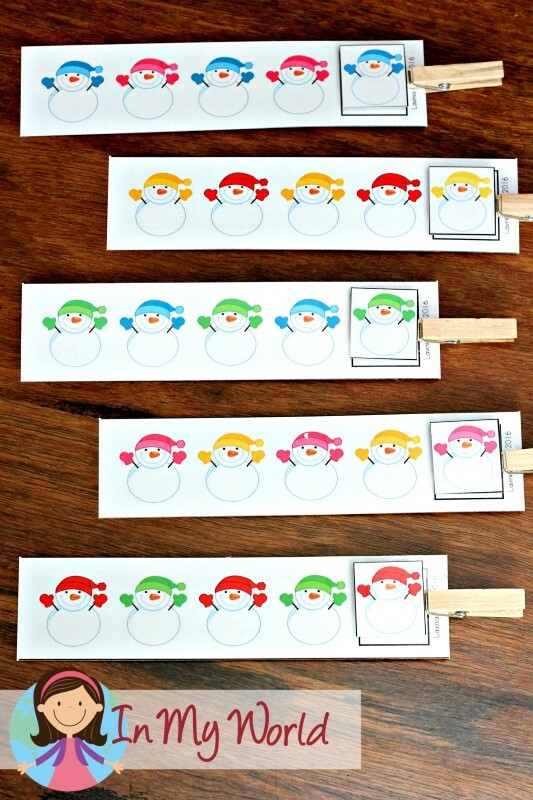 Children are simply required to match the pom-poms to the correct snowman. 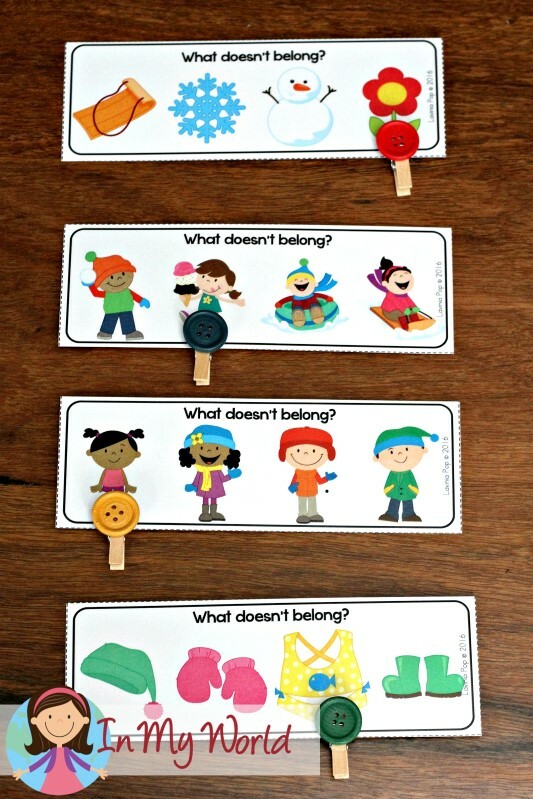 Also included are “What doesn’t belong” activity cards, that require children to think what each item represents and which one is different. 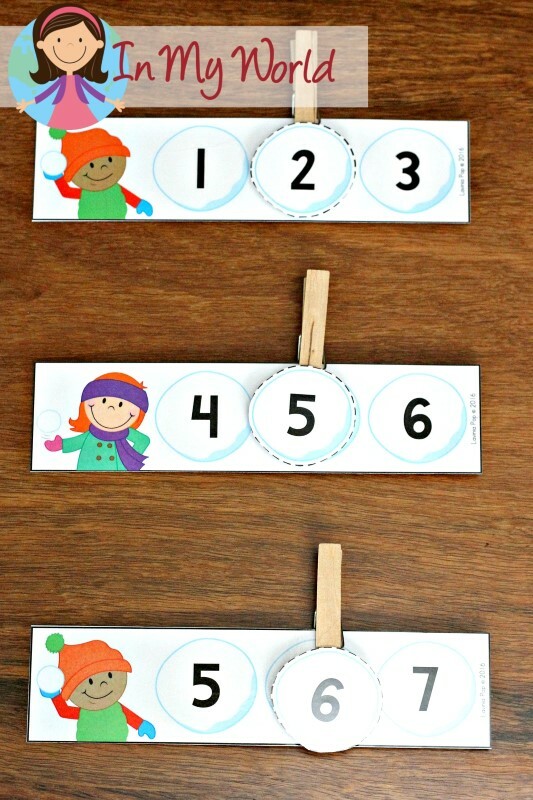 The aim of this activity is for children to order the cards to show the sequence for building a snowman. The aim of this activity is for children to order the cards by size. 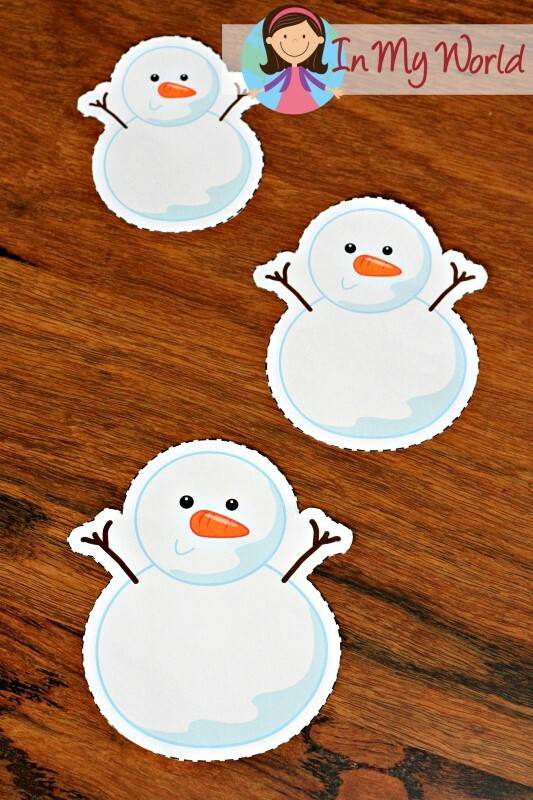 To help kiddos work on identifying shapes, I have included a snowman shape sorting activity. 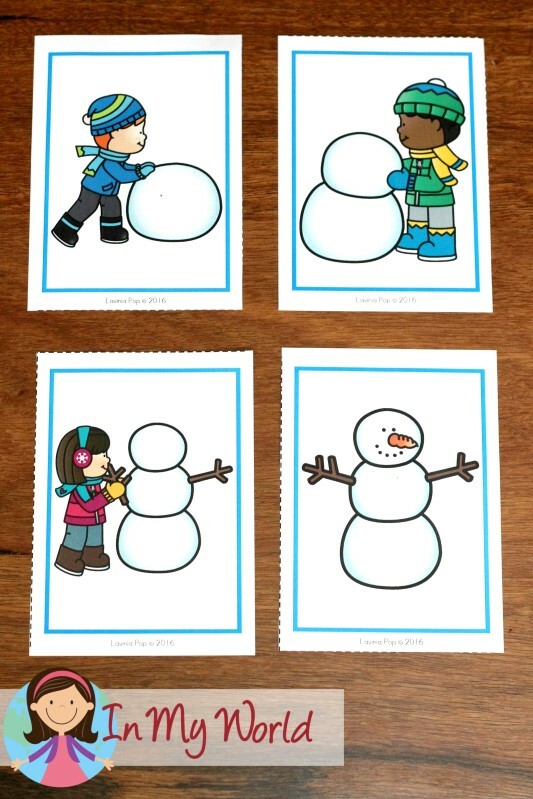 Children are required to to match the snowman shapes together to build a complete snowman, including head, middle section, bottom section and hat. 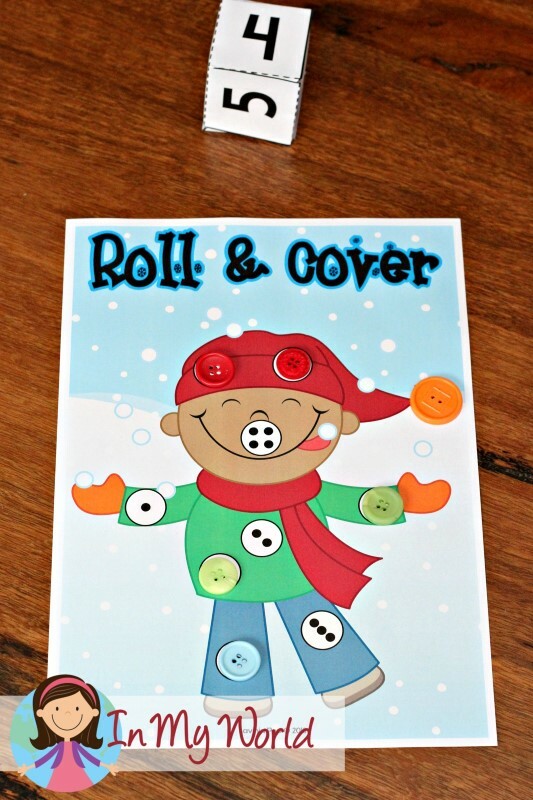 To help with number sense, I have included a “Roll and Cover” activity that requires children to roll the die and cover the corresponding amount of dots on the picture. I have also included a number tracing activity. The cards can be kept together in a book-like format by making a hole in the top of each card with a hole punch and securing together with a key ring. For this next activity, you could glue some cotton balls on to the end of a clothes peg, use cotton balls without the pegs or real marshmallows. I decided to use these small number erasers. The aim of this activity is for children to count out the number of marshmallows indicated on each hot chocolate cup or mug. 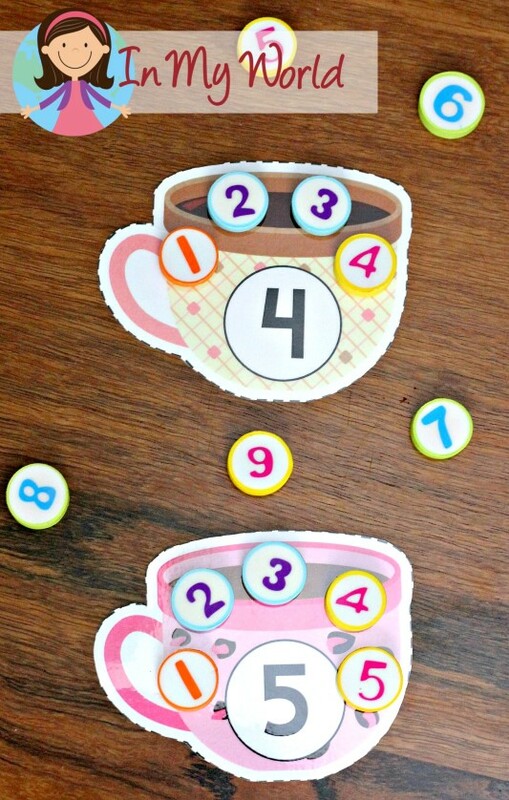 The aim of this activity is for children to match the numerals to the correct then frame. The aim of this activity is for children to identify the missing number and to clip the correct number in the missing spot to complete the number sequence. 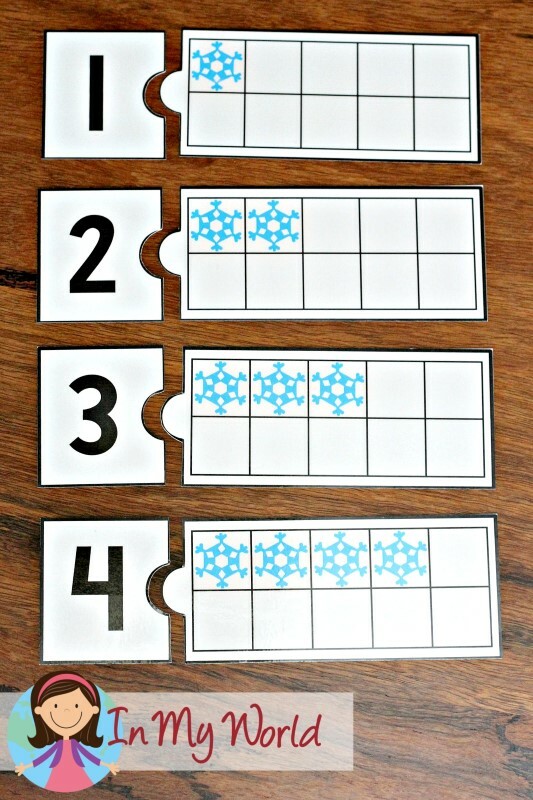 The aim of this activity is for children to identify the pattern on the cards and to clip the correct picture in the empty box to complete the pattern. 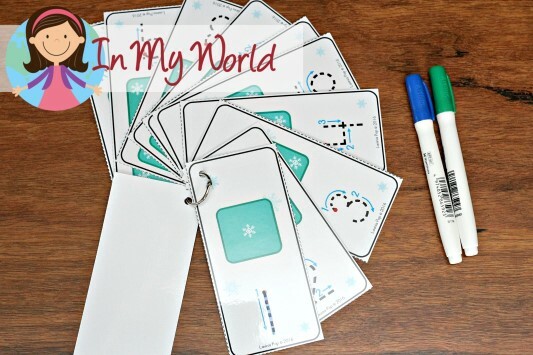 I hope this post has been helpful in helping you determine whether my Winter Preschool Centers packet is something you would like to purchase for your children! Please click the image below to purchase it from TpT and/or read customer reviews. 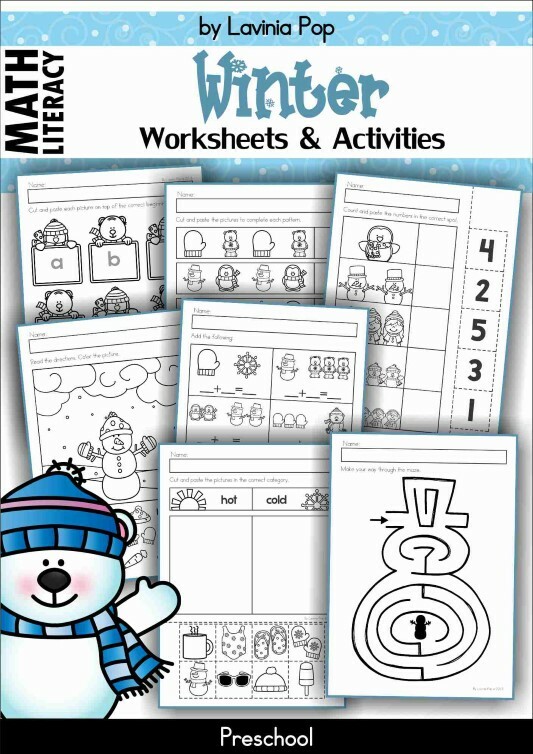 If you’d like to save on colored ink, please check out my Winter Preschool Worksheets packet by clicking the image below! I love your center ideas! So cute and so creative thank you for sharing! I love all your activities and products. They are priced right and very useful! The Snowman Color Matching are adorable! Did you make or can you make these in the primary and secondary colors? Red, Orange, Yellow, Green Blue, Purple and maybe Pink, Tourquoise too? I love these and so do my kiddos! I was wondering if it would be possible to get the rest of the letter for the beginning sounds with the hats and mittens? That seems to be a favorite!